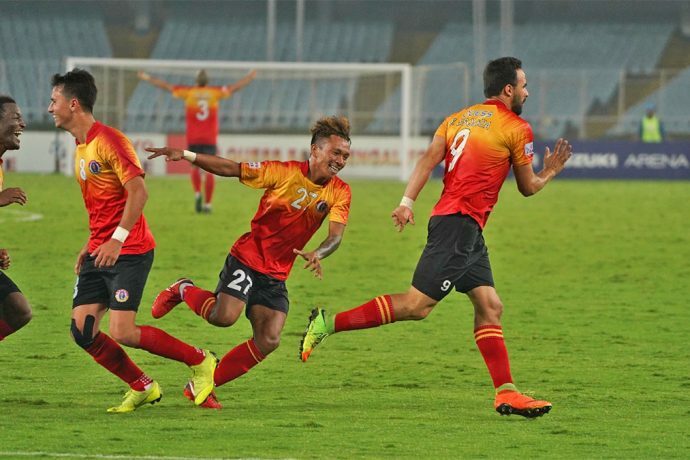 Quess East Bengal FC (QEB) kept their maiden Hero I-League title hopes well and truly alive with a comeback victory against NEROCA FC, thanks to an Enrique Esqueda double in the second half, which helped overcome comeback man Chencho Gyeltshen’s strike as early as the third minute of the game. In front of their home crowd at Kolkata’s Vivekananda Yuba Bharati Krirangan (VYBK), QEB looked out of sorts in the first half, but in the second, inspired by Spanish coach Alejandro Garcia’s substitutions, totally turned the tide on NEROCA. The win now solidifies QEB’s fourth position on the table and their 28 points from 14 games, means that they are just two behind second-placed Chennai City FC, who have also played the same number of games. Debutants Real Kashmir top the table with 32 points, but they have played two more than QEB and Chennai. So have third-placed Churchill Brothers who have 29 points. NEROCA remain fifth with 25 points from 16 games. Garcia, in fact, had fielded an unchanged XI at the start of the big game, whereas his NEROCA counterpart and countryman Manuel Fraile had made as many as six changes. One of the most significant changes made by him was to bring Lalit Thapa in goal in place of Italian Maouro Borcheiro and playing ‘Bhutanese Ronaldo’ Chencho in place of Nigerian frontman Felix Chidi. Chencho had a chance to score off his first touch in the game after Subhash Singh played him on inside the box from the left, but his effort took a defender’s touch and went out. The QEB defence and keeper Rakshit Dagar made a hash of Katsumi Yusa corner and the ball fell for a lurking Chencho, who stabbed it home. It was not as if QEB did not have chances to get the equaliser in the first half itself. First, Laldanmawia Ralte found the net with a neat trap and booming volley, but was narrowly called for off-side. Tony Dovale’s effort off a well-worked out corner in the 43rd minute brought off a good collection from the veteran Thapa. Jobby Justin rounded off QEB’s efforts in the first half with a stunning volley on the turn but again, Thapa was up to the task. QEB looked more determined in the second half and centre-back Borja’s headed goal off a corner in the 55th minute was again disallowed and ironically Danmawia was again called out for interfering with play from an offside position. Alejandro Garcia had already started making his moves and one of those, bringing in Mexican striker Enrique Esqueda in place of Toni Dovale, eventually got QEB the equaliser. Borja, who was coming up regularly to help in attack, found Colado outside NEROCA’s box on the left. The Spaniard looked up and saw his strikers Esqueda and Justin make their moves inside the box and floated in a delectable ball. Esqueda met it first and placed a header past a diving Thapa, who had no answer this time. The winning goal, in fact, involved all three of Garcia’s substitutes. Brandon received a long ball on the right channel and played on Samad Ali Mallick, who had made a fine run. Samad’s cross found Esqueda in perfect position and his composed header across Thapa, beat the NEROCA keeper comprehensively again. The Mexican, who had scored twice for the Red & Golds in the first leg encounter between the two, seemed to have had a deja vu moment tonight.